Then, in my last update to the OED house rules [link], one of the edits I made was to change the penalty for range from a short/medium/long categorization to a flat −1 per 10 feet shot. The model that I was using previously followed the standard D&D three-step range categorization, but altered the modifiers in question, based on UK long-distance clout shooting tournaments and a computer-simulated model (per links above, and simulator software on GitHub). But in practice (based on my regular campaign game this year) that seemed very weird. While the real-world-accurate model seems like it should be quadratic, what I realized was that a linear approximation is "good enough" in the close ranges where it matters. If the penalty at 480 feet turns out to be −48 when it should really be −32, that is, of course, entirely academic and won't make any practical difference in-game. Example: Recently my PCs were traveling up a mountainous stairway ridge while under fire from a group of goblins. The PCs were crawling on the stairs to minimize their chance of being knocked off, while attempting to return fire. But the PCs could crawl for a few rounds with no change to their shot chances, and then suddenly in a certain round, the threshold to the next category would be reached, and the penalty suddenly collapsed. The players were somewhat nonplussed by this, and I think reasonably so. Hence the new rule which is both brain-dead simple to compute mentally and makes for a smooth, continuous gradation as opponents close with each other. Since I posted that, most enticingly, an new academic paper of interest has been published: Milks, Annemieke, David Parker, and Matt Pope. "External ballistics of Pleistocene hand-thrown spears: experimental performance data and implications for human evolution." Scientific Reports 9.1 (2019): 820 [link]. The background starts with some academic debate about the distance at which primitive spear throwing cultures could hunt prey: Many argue only 5-10 meters? Perhaps 15-20 meters? Some reports assert 50 meters? What the authors do here is put the issue to a field test. 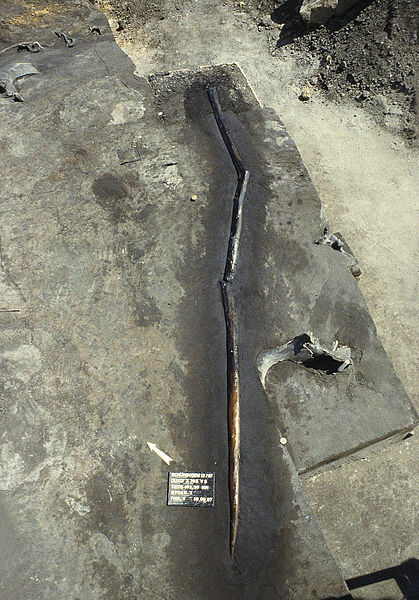 First, they made replicas of 300,000 year-old wooden spears, presumably used by Neanderthals, as found at the Schöningen archaeological site (as shown to right). 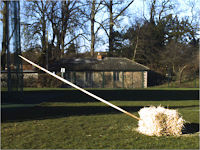 Then they found a half-dozen trained javelin athletes, set up hay-bale targets at various distances in a field, and had them throw a total of 120 shots (e.g., see picture at top). These shots were captured with high-speed cameras from which they could procure data on accuracy, speed, kinetic energy on impact, etc. From this it seems clear that the impacts could kill prey on a hit. For my purposes, I'm mostly interested in the hit success rate. Here's the chart presented by the authors, followed by my recreation and regression on it. 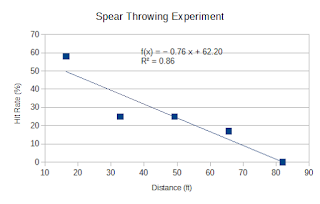 A few side points: Note that the 60 feet maximum to score a hit on bale-sized target is very different from the maximum distance throwable with the spear. The researchers also had the participants take a few throws purely for maximum distance, and these ranged from 20 meters to a bit over 30 meters (i.e., over 90 feet). Compare this to the base D&D system which fails to distinguish between the maximum bowshot and the maximum hittable bowshot, say. 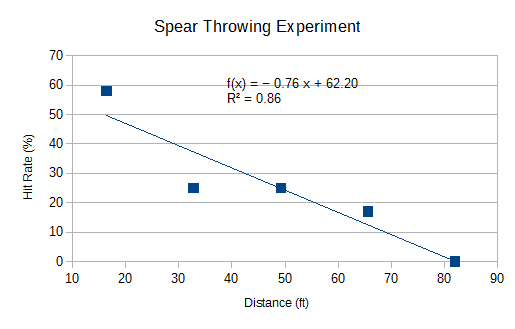 Interestingly: The more experienced throwers (in years) could throw longer distances, something we don't model in D&D. Another point in that vein is that the hit rates are fairly low. In D&D, granted 4th-level fighters, an unarmored AC 9 target, and say +6 for being motionless/helpless as well, with −1 for 15 feet distance, I would expect to make a roll of d20 + 4 + 9 + 6 − 1 = d20 + 18, i.e., 95% chance to hit (compared to 58% at the first distance in the experiment). But the experiment run by the authors hobbles the throwers in at least two ways. One: "The participants in this study [were] trained in throwing but not in aiming for a target", which reflects standard javelin-throwing competitions today. So perhaps we should lower the equated fighter level in this regard. Two: Hay bales flat on the ground make for a very short target: around 1½ feet, only one-quarter the height of a man or horse, say? (As noted in my own long-distance archery field experiment with older equipment, it's easy to get shots laterally on target; the difficulty is getting the long-short distance correct; link.) 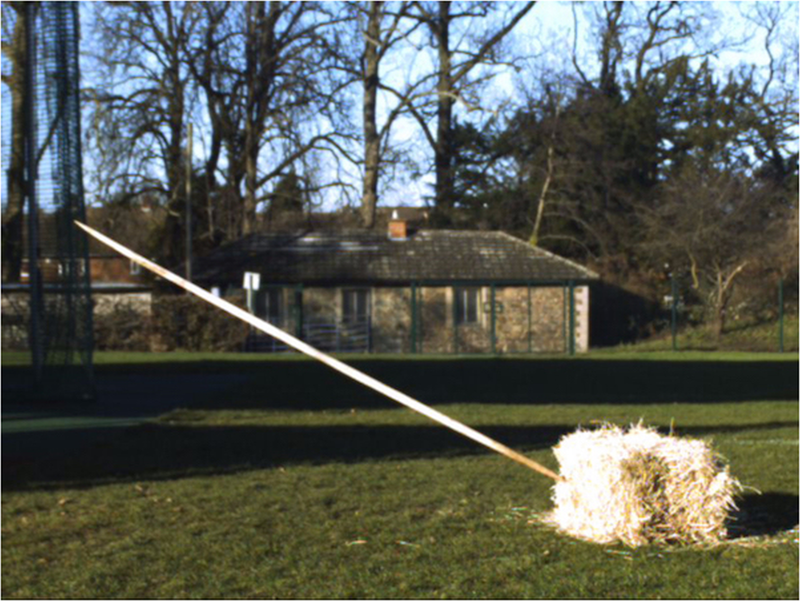 The researchers here took a few experimental shots at 10 meters with two hay bales stacked on top of each other, and the hit rate immediately jumped from 17% to 33% (i.e., doubled). So perhaps our D&D model should also include a penalty for the short target. I'll leave crunching those numbers as an exercise for the reader (they work out reasonably well). It's always super neat to see people putting historical speculations to practical tests -- especially this one, based on a 300,000 year-old find. Major thanks to Milks, Parker, and Pope for thinking this one up! This is really interesting. I have been toying for a while with the idea of a different combat system that is both historically realistic and not a chore to play and remember. I share your goal! After experimenting with a bunch of different stuff over the years, the -1/10 feet rule has been working really well for me in recent games. And it does seem close enough to reality, from what research I've done. To me, the difficult part is assessing and remembering at the table how far away combatants are. I have used minis but I find them a bit of a hassle, and drawings get messy soon. It's a good point that I almost put in my comment above. I'm effectively totally off using minis. Usually I travel for a game and just don't have any available. If I'm at a friend's place that has a supply I may use them if the players want. Most of my distance engagements seem to be PC-mob vs. monster-mob, and may I keep distance jotted down on an index card. Approximating it is of course fine. The thought did occur to me that maybe the three-range distance might help for minis where you can kind of ballpark it without a ruler. (?) My -1/10 feet rule would mean, with minis, you'd need to tape-measure every most every shot. But if I'm describing distance verbally then it's immediate to do the conversion. Finally got around to watching some Wandering DMs yesterday (Clerics, Thieves, and the door in Peru—enjoyable! and a *helpful* nugget or two was taken away from the Thieves discussion), and I think Missile Fire would make a good topic—the range work, the sling stuff, Hobbits' deadly accuracy, its development from Chainmail (man v man contra mass combat), how do you guys handle it with melee, position (marching order), initiative/phases, cover/concealment, and so forth! Thanks for the compliment! And great suggestion on a ranged-attacks conversation -- I'm too close to it to think of that as a discussion idea. Just added it to our list. Thank you! The spearmen in my system don't throw spears that reflect 300,000 year old technology, but rather the best spears that could be made in 1650. So the data here really doesn't apply. Do you have data that such spears go further? If not, this stands as the null hypothesis. A single hay bale laying down is pretty much simulating a prone target, albeit a large one. If they weren’t using atlatls they weren’t using using the best prehistoric spear hunting technology. Curiously, the actual data as opposed to the fitted line could be taken in support of 5m short, 15m medium, 20m long ranges under the traditional rules, since their results for 10 and 15 meters were the same. Athletes trained only in distance are at best semi-proficient 0-level when it comes to spear hunting. I’d be curious to see how much better actual spear hunters do. To capture at least part of the difference, javelin athletes who train at targets for a month and test again would make sense. I agree with a lot of those points. Note that the a month later, starting with long-range archery statistics from competitive archers, coincidentally also came up with the effectively same range modifier: -7.5% per 10 feet (in the range of maximum rate-of-change). So at this point I lean towards the consistent single rule rather than discrete range categories for different weapons.